My life, under the microscope...: BIG project sneak peak! If you're wondering about the big scrimshaw project I've mentioned a little bit, here's a sneak peak at the "canvas" (um, ivory!) on which I will be working. 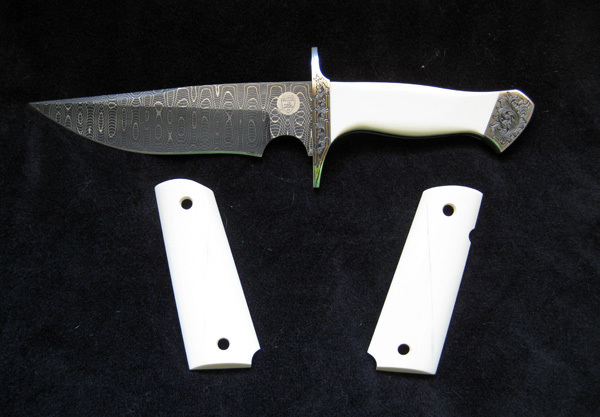 Those are grips for a Colt 1911, and an incredibly gorgeous Bowie knife. The theme: The Greatest Generation. I'm working on preliminary stuff now, sketches, ideas, making a million revisions before I even show my client, etc. This is where I LOVE photoshop, I can do a lot of my "sketching" there, and it's so much easier to selectively edit, add, delete, resize parts, etc. of "Greatest Generation"? I am anxious to see your take on the WWII era. That Lewis and Clark...Oregon Trail.. was a feisty generation too!